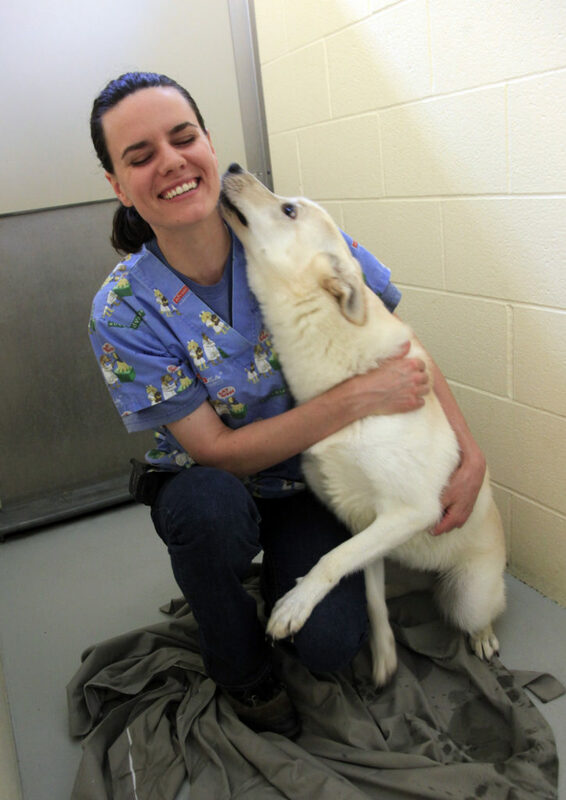 As Kayse Aschenbrenner, director of animal welfare at the Lawrence Humane Society, playfully rubs the belly of a husky mix named Sandy, it’s hard to imagine that a few months ago someone abandoned Sandy and another dog, Tony, at an apartment. Kayse Aschenbrenner, director of animal welfare and cruelty investigation at the Lawrence Humane Society, 1805 E. 19th St., plays with a dog that was brought in after it was found abandoned in an apartment with another dog. Both dogs are now ready for adoption. • Hitting an animal with a stick, chain or club. • Abandoning an animal within the city limits. • Transporting an animal in a trunk or unrestrained in the bed of a truck. Punishment for those convicted of violating the animal cruelty ordinance can include a $1,000 fine and up to six months in jail. The Lawrence Humane Society is empowered to enforce and investigate offenses. They were left without food or water. “It’s amazing they survived,” Aschenbrenner said. In the next hallway, Aschenbrenner, whose job it is to investigate reports of animal cruelty, introduces two 8-week-old kittens found recently in a hot car. “They were so thirsty,” she says of the kittens, who have been nursed back to health. But those cases, and other high-profile incidents of animal cruelty and neglect, are the exception, not the rule, for the roughly 500 cases the Humane Society investigates every year. “A lot of it is just real easy educational things to take care of,” said Midge Grinstead, Humane Society executive director, who also helps investigate abuse and neglect cases. Sometimes it’s a dog that knocks over its outdoor water dish while its owner is at work; a simple fix is digging a hole for the dish. Or a dog has outgrown its doghouse and the owner can’t afford a new one; the Humane Society can help an owner purchase one. “We try and help any way we can,” Grinstead said. The Humane Society will help pay for food, shelter and other supplies when owners cannot, all with the goal of keeping an animal safely in the home, she said. In some of the more severe cases, the agency has the authority to remove animals. While the numbers vary, the agency seizes dozens of animals every year because of severe abuse, or when an owner fails to comply with the agency’s recommendations. “There’s always a point where they either have to take care of the animal or we’re going to take it,” Grinstead said. If that happens, the agency starts the legal process of terminating an owner’s rights, and some cases lead to criminal prosecution. Between 2007 and 2009, the city of Lawrence prosecuted 38 cases of animal cruelty, while the Douglas County District Attorney’s Office prosecuted 11 cases involving animal abuse. Some of those cases can highlight the dark side of human behavior, Grinstead said. “We see the worst that people can do,” she said. The toughest cases leave a deep impression, even on the seasoned workers. Grinstead tells a story about having a panic attack when someone who came into the shelter to adopt a kitten had an eerily similar voice to that of Cem Basoflas, the Turkish student at Kansas University who pleaded guilty in 2009 to severely abusing a cat and torturing a dog. “It brought back all the things that man had done,” she said, adding that they brought in counselors to work with the staff following the case because of the traumatic nature of the abuse. The work the agency does would not be possible without the regular calls they receive from neighbors, construction workers or mail carriers who spot something suspicious. Aschenbrenner encourages community members to pick up the phone, even at the risk of upsetting a neighbor. “Whether they think it’s an insignificant thing or a really huge thing, it’s always best to just call, because you never know,” said Aschenbrenner, adding that all calls are always kept anonymous. The agency also has a “no questions asked” policy for those who don’t want their animals, leaving little excuse for the abandonment they saw in Sandy and Tony’s case. “Just drop them off,” she said. Aschenbrenner, who receives frequent training on investigating animal abuse, calls her work a “lifestyle,” evidenced by the long list of her own pets: two birds, four dogs, one cat, two foster cats and a litter of kittens she’s bottle feeding. By letting the community know of the work the Humane Society does, and the support they can give to pet owners who need it, she hopes to avoid cases of neglect like Sandy and Tony. The time they were left alone took its toll on the dog’s behavior, but the staff has worked with the two to get them ready for adoption. Tony is set to go to his new home in the coming days, and Aschenbrenner’s confident the cuddly Sandy will soon find a home.